The 7th Annual 911 Power to the Peaceful Festival, a lefty-fest of music, art and activism will take place September 10 in Speedway Meadow of San Francisco's Golden Gate Park. 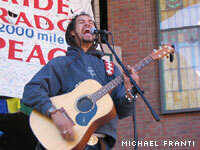 The free event, organized by Michael Franti of Spearhead, will feature performances by Jean Grae, Saul Williams, Anti-Flag, Zap Mama's Marie Daulne, J-Boogie's Dubtronic Science, Glide Choir and, of course, Michael Franti and Spearhead. Angela Davis, Woody Harrelson and Robert Greenwald (filmmaker - Outfoxed, Wal-Mart) and Tim Goodrich (Iraqi Vets Against The War), among others, will also be in attendance to speak on the show's theme, bringing home troops from Iraq, as well as a multitude of other world issues. The PTTP festival was originally started by Franti as a way to bring attention to the plight of Mumia Abu-Jamal and the evils of the military industrial complex, but he expanded its focus after September 11 to issues of peace in the face of terrorism and war. The festival has grown exponentially in the past few years, and now includes a gaggle of art galleries, film festivals, and do-gooders pushing everything from bio-diesel to "forest stewardship certified" wood skate ramps. Don't you just love the West Coast? The event will be broadcast live on Pacifica station, KPFA (94.1 FM in Berkeley or http://www.kpfa.org/).